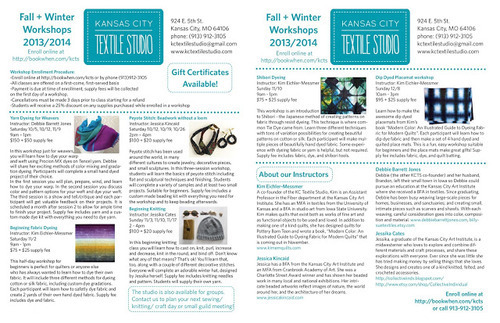 The Fall/Winter workshop schedule is ready! We are so excited to be offering six fun and informative workshops by four amazing instructors. Kim Eichler-Messmer is teaching three different dye workshops: Beginning Fabric Dyeing, Shibori Dyeing, and an awesome new Dip Dyed Place Mats workshop with a project from her book “Modern Color: An Illustrated Guide to Dyeing Fabric for Modern Quilts”. Debbie Barrett Jones is teaching a great workshop called Yarn Dyeing for Weavers where participants will learn how to plan and dye a weaving using dyed warp and weft. Jessica Kincaid is teaching a Peyote Stitch Beading workshop that Kim is especially excited about. And Jessika Cates is going to be teaching beginning knitting where everyone will learn the basics of knitting and make their own adorable winter hat from Jessika’s own pattern. There is a "workshops" link on our website that will allow you to view a larger pdf of the flyer below. If you see something you like, sign up at http://bookwhen.com/kcts or call us for more information (913)912-3105.